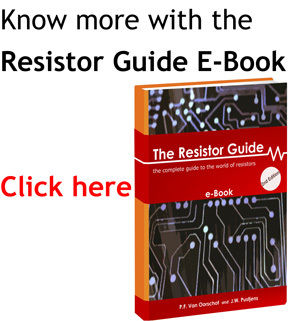 Heater resistors are used whenever an electronic device needs to generate heat for some reason. They are designed as a special type of power resistor to provide a reliable and controllable source of heat. A heating resistor can produce convective heat, meaning it heats up the surrounding air, or radiant heat, meaning it heats other objects directly through a phenomenon called infrared radiation. Radiant heating requires the heater resistor to be placed within line of sight of the object that is to be heated, while convective heating sometimes utilizes fans to blow air over heater resistors in order to increase the heating effectiveness. Heater resistors are a special type of power resistors whose main purpose is to convert electrical energy into heat. Wire-wound radiant heaters are essentially wire-wound power resistors. The heated object receives heat by absorbing infrared rays emitted by the glowing-hot wire. Some of the energy is given off as light in the visible spectrum as well. A reflector is often added behind the resistance heating element in order to direct as much heat as possible in the desired direction. The wire can be exposed or enclosed in a tube to protect it from damage. This is especially useful if there is a risk of water drops falling on the element, which could cause thermal stress damage. Wire-wound radiant heaters are often used in bathrooms or outdoor uses where the intent is to heat a person without having to heat up the surrounding air first. Halogen radiant heaters, often called quartz heaters, are similar in design to halogen light bulbs. They are most often made of a quartz tube with a tungsten resistive filament inside of it. The air from the tube is evacuated and replaced with an inert gas such as argon or nitrogen, and a small amount of halogen gas is added to prolong the heater lifespan by protecting and cleaning the filament in a chemical process called a halogen cycle. A reflector is added behind the heating element to direct the heat energy in the desired direction. They are often equipped with safety mechanisms which turn off the heater if it is tipped over, to prevent fires. Halogen heaters are often used in technological processes requiring contactless heating, such as chemical processes, paint drying, food processing and thawing, as well as incubators and heating augmentation in cold rooms. Electric convection heater have a heating element which is exposed to air. Once the air is in contact with a hot object it heats up and, due to the fact that hot air is lighter than cold air, rises up, leaving space for more cool air to come in contact with the heater from below. This process is called air convection. Electric convection heaters sometimes do not heat the air directly, as is the case in oil radiators. In such devices, the heater element is in direct contact with special oil which spreads the heat throughout the radiator. The heat is then transferred to the surroundings by air convection. A special subtype of convection heaters is floor heating, which uses resistive wires to heat the entire surface of a floor in a room. The heat is then transferred to the air by convection, but the heat difference between the floor and the air is kept under a few degrees to avoid unpleasant air convection currents. Fan heaters are similar to electric convection heaters, except air is forced over the heating element by means of an electrical fan. These heaters are used to heat up closed spaces such as rooms or vehicle interiors while the engine is still warming up to operating temperature. The downside to using fan heaters is that they are noisy compared to traditional convection heaters, although recent advances in technology have reduced the amount of noise generated by fans. The heater element is often constructed of a PTC thermistor. 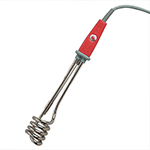 Submersible heater elements are resistive heaters used to heat up liquids. They are electrically insulated to maintain safety and prevent electrolysis of the liquid that is being heated up. Many applications call for the use of immersion water heaters, such as water heaters, water boilers and aquarium heaters, which are equipped with a thermostat to maintain constant temperature. If a submersible heater element is constantly in contact with hard water, as is the case in household water heaters, limescale (calcium carbonate deposits) eventually builds up on the heater element. As the element is cycled on and off, the thermal expansion and contraction of the element breaks the limescale and it falls to the bottom of the container, a process which over time can significantly reduce the liquid capacity of the heater. Industrial liquid heaters are custom designed and built for the application. Examples of industrial applications that call for electrical heating are asphalt heating/melting, bio-diesel processing, clean steam generation, food processing, textiles, pharmaceutical processing and many more. The number of interesting applications for heating resistance wire is overwhelming, and only some of them will be listed here. For example, heater resistors can be used in heated motorcycle hand grips for driving in cold weather. or special heating resistors embedded in, or sometimes applied to, the surface of a car window which are used for de-fogging and de-frosting, most often seen on the rear window in the form of resistive tracks on the glass. Another useful application is surveillance cameras. A heater resistor is placed close to the glass cover and the lens. The heat from the resistor keeps the glass temperature above the dew point, which prevents fogging and snow buildup, which keeps the camera useful in all weather conditions. In order to accurately develop photographic films, a very precise and constant temperature is required, otherwise colors will degrade. In a similar way, many chemical processes need a constant temperature and heating might be required. Some medical equipment, such as blood analyzers, also needs constant temperature to operate correctly.